Seared Steelhead Fillets from the Rogue River. September First and the wild harvest of the Fall begins. 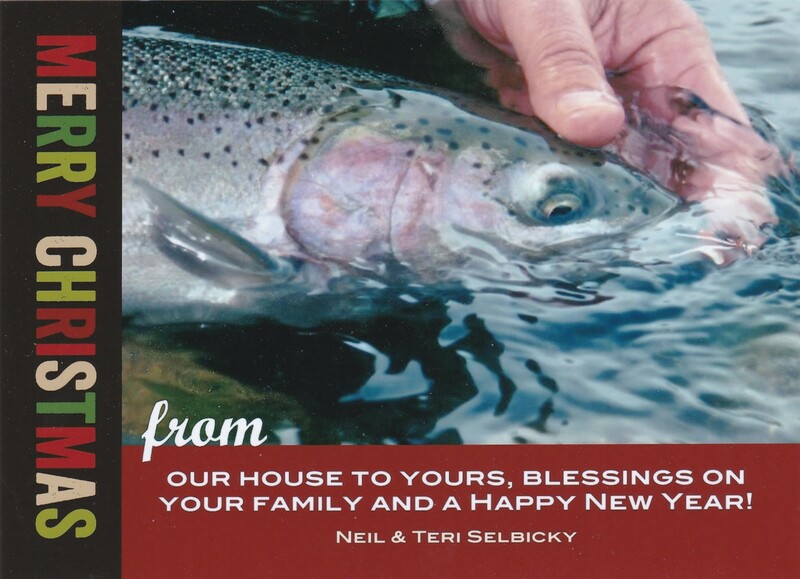 There are still coin bright July and August summer steelhead languishing in the pools of the upper Rogue River. Right on time the water flow has risen to bring up migrating Fall Chinook salmon and steelhead from the Wild & Scenic canyon of the river. The cooling air of the Rogue Valley reveals that the heat of the summer has left a bountiful array of treats in the garden. Bright red tomatoes are to be picked as well as potatoes dug. Lettuce and basil is to be plucked from their beds. Together all come together in a culinary feast of the season. I don’t know if you have discovered Blue Apron or any of the other Dinner-Kit Services that deliver fresh meals and ingredients directly to your door. Complete with chef inspired recipes printed on colorful 8 x 11 cards, you cook and assemble the gormet meals at home yourself. Often I like to substitute fresh steelhead for the sustainable seafood Blue Apron sends. In the dinner pictured above, Seared Salmon & Sauce Gribiche, I have substituted fresh, Rogue River steelhead for the packaged salmon. (The salmon was squirreled away in the freezer for the future.) I further enhanced the meal with red potatoes, cherry tomatoes and parsley from our garden. Blue Apron supplied the base of the ingredients including summer beans, shallots, cornichons and Dijonnaise. Putting it all together, this came to be one, tasty , end-of-summer meal! 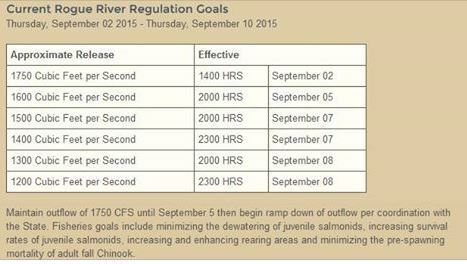 As for the fly responsible for the September steelhead catch? You can give full credit to the Beadhead G.R. Hare’s Ear Nymph. G.R. Hare’s Ear Nymph. Always a good choice on the Rogue River of Oregon. Momma merganzer was trying to bring her train of little ducklings up along the shallows near shore. 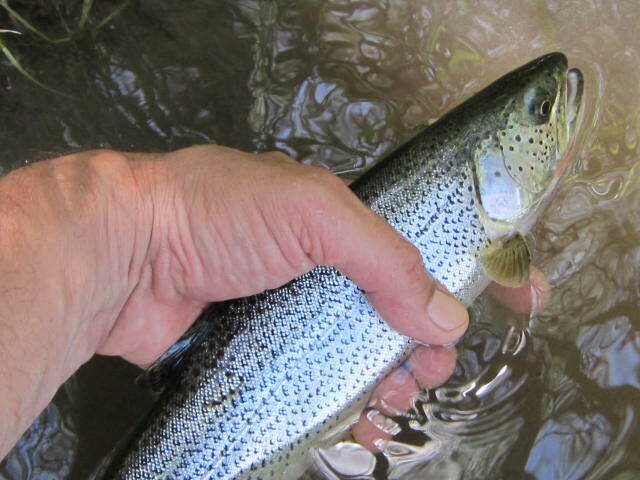 This handful of Rogue River cutthroat greedily attacked a swung wet fly . 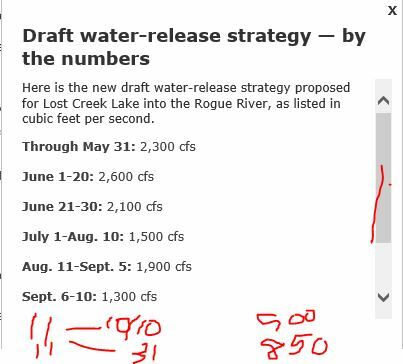 By the numbers here is what I have for the water release schedule into the Fall . I added the last two entries for November 2015. Tunnel back for the big ones. foray for the fresh morel mushrooms. The April temperatures have remained perfect for the little fungi. April rains have been light and very welcomed for the ground was getting a little dry. The outlook for the balance of the month looks very favorable. A steelhead run along the banks of the Rogue River. 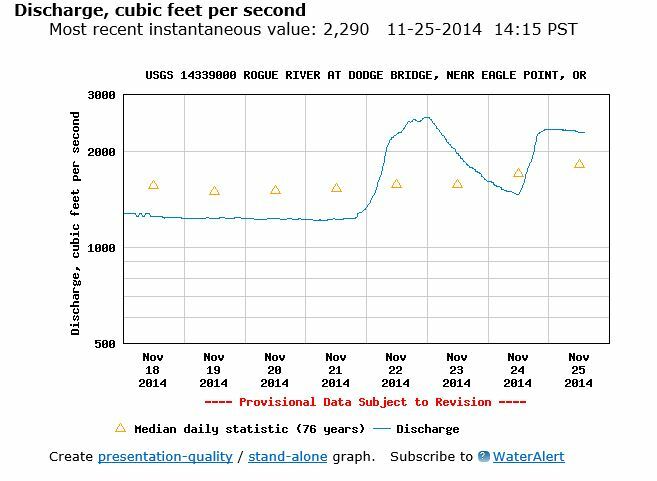 Clearly November conditions on the Rogue River. Nature! Why is this stonefly nymph is so large this time of year? Cold and wet, but not quite winter yet. Here’s the pattern I need a name for. I’m just going with Large Brown Stonefly Nymph. November wild fungi on a fallen log. In this case oyster mushrooms! Oyster and hericium mushrooms from along the Rogue River. Twilight blacktail buck drawn to a doe. November twilight sky over the Rogue River. A good November day searching for steelhead on the Rogue River, Oregon. I spent a lot of time casting the new natural flies with nary a bite. I even tried some of the gaudier Carpetbagger Nymphs in the cold, green water. 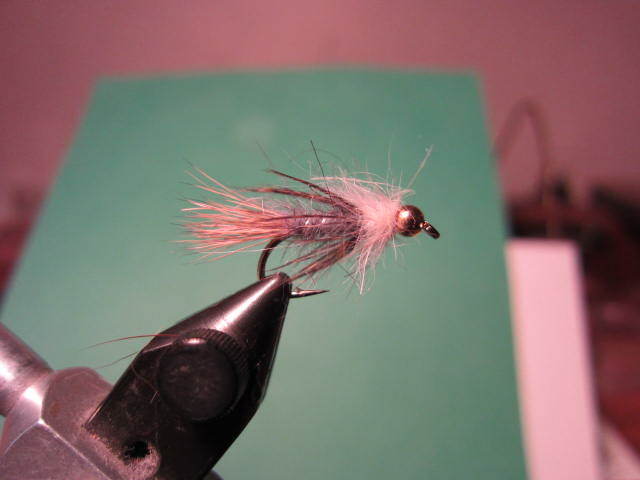 Nothing was working until late when I began catching trout with the ‘Hare’s Ear look-a-like. And then, wouldn’t you know it, a pulverizing strike on the swing through a shallow tailout section. Zip, zip, break…the 6 pound test parted. The dilemma; fish the 6 pound tippet in lower, cold water in order to get more strikes, or up the pound test of the tippet to #8 in order to land more steelhead? Good question, any suggestions? Here is the fly that has captured most of the attention. A small fly with a lot of the elements of a G.R. Hare’s Ear Nymph.